Classmates Gathering. The teenagers’ time is the craziest, the funniest, the one where we fall in love and we suffer if that love isn’t returned. We are carefree, don’t bother with more than ourselves, our job is to study and take care of our self. Being in a high school is very important time. You get to meet friends, some of them will stay good friends forever, some will last until the prom night, but the memories will stay forever. Fortunately, there is the tradition of celebrating anniversaries and then from time to time you get to see each other, each five, ten years… And the common wish always is – to be healthy and alive to be able to see each other at the fiftieth anniversary. Today game is about sharing memories. It is about finding the mutual things that one generation makes specific. Hellen and Brian are class mates. Exactly twenty years ago they learned in the same High school. Together with their other classmates. They came to visit their school, to celebrate the jubilee – twenty years from the finishing of the high school. They are curious to see how their school looks like after so many years and start looking around. They search for some objects that remind them of their school days. 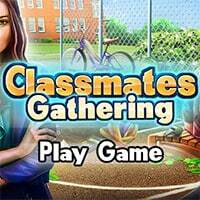 Enjoy and have fun in playing Classmates Gathering Game.